On Vaccination Against Smallpox is Edward Jenner's publication of his research into creating the smallpox vaccine. When in 1788 a smallpox outbreak hit Gloucestershire, Jenner noticed that people who worked with cattle and had caught the mild disease cowpox, which was not fatal, then never came down with smallpox. 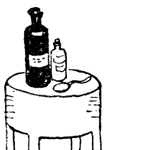 He found ways to test his observation, and in 1796 his experiments showed that giving a small dose of cowpox to a person gave that person immunity to smallpox. Despite much initial disbelief by his peers, the smallpox vaccine became one of the most significant scientific breakthroughs. Source: Jenner, E. (1798). On Vaccination Against Smallpox. The introduction and brief biography of Edward Jenner. "An Inquiry into the Causes and Effects of the Variole Vaccine, or Cow-Pox, 1798"
The author describes the causes for the vaccine and symptoms of smallpox. "Further Observations on the Variola Vaccinae, or Cow-Pox, 1799"
The author describes the symptoms that have appeared in and on the cows and how he treated them. "A Continuation of Facts and Observations Relative to the Various Vaccines, or Cow-Pox, 1800"
The author describes the aftermath and effects of the vaccine inoculations. Jenner, Edward Anthony. On Vaccination Against Smallpox. Lit2Go Edition. 1798. Web. <https://etc.usf.edu/lit2go/51/on-vaccination-against-smallpox/>. April 18, 2019. Edward Anthony Jenner, On Vaccination Against Smallpox, Li2Go edition, (1798), accessed April 18, 2019, https://etc.usf.edu/lit2go/51/on-vaccination-against-smallpox/.